Do you enjoy the occasional cross-word or sudoku? While fun, these brain twisters are fairly mundane. Thanks to their portability, our smartphones and tablets can become awesome brain exercise machines that fit in our pockets. In addition, mind training apps' colorful interfaces, game-like nature, and quick, touch-based controls can make interacting with them not only beneficial, but very fun. Brain exercise apps don't require you to spend hours in training or solve complex scientific problems. They need 10 to 15 minutes of your time every day, or as much time as you want to devote to them, actually. The 10 Android & iOS apps we've presented here feature colorful graphics, creative puzzles in different categories, rank-lists and awards. They offer a more meaningful way to distract yourself from boredom than besting Flappy Bird records, and will actually help you improve your memory and concentration in the long run. Have fun with these! The Moron Test is brain exercise for self-ironic types that won't mind its off-beat humor. Featuring harmless children's book visuals and seemingly simple puzzles that will take you from Moron all the way to Genius, the game will both amuse and anger you in a positive, constructive way. Unfortunately, the free version is riddled with full-screen video ads to annoy you into purchasing the full version. Then again, it's good, mindful fun - there's nothing like watching you and your friends fail at simple puzzles, such as pressing rubber duckies and colorful buttons in the correct order! Mind Games is more akin to a health app rooted in science and textbooks rather than a chummy, colorful game - which doesn't mean you can't have fun with it. The activities are as simple as is the interface itself, but they are guaranteed to give your brain a good workout. The activities are centred around attention and memory training, anticipation, vocabulary power, directional thinking, and more. There's the added bonus of a training scheduler that could trigger daily reminders to start a mental workout. It's a worthy addition to your brain-teasing collection. The game and its sequel are old-school quests that puts you in a series of rooms which you must figure out how to escape. By solving puzzles which utilize objects and scenery, you will engage your creative mind. The game can get rather surreal at times, but this is to be expected from quests such as this. The best part is that when you finish the first game, the second will be at your disposal so you can continue escaping the confines of rooms and getting smarter. Both games are free and feature 10 and 8 levels, respectively. This wonderfully styled app puts you inner eye to inner eye with Andy Puddicombe, former Buddhist monk and renowned expert on meditation and relaxation techniques. Headspace is untouchable when it comes to guided meditation. It comes with built in tutorials, programmes, progress reports and it really makes it easy to get meditation right. It also has a random mindfulness "buzzer" which reminds you to "check in with yourself" a few times a day. The many stressed-out, anxious among you should consider trying the 10 free sessions, while the rest of the content is available on a subscription. Lumosity is designed by neuroscientists to train memory, attention, and more. At launch, the app will ask you which areas you seek improvement in, and chalk up your very own exercise program. It will take you only 15 to 20 minutes a day, and being designed by neuroscientists doesn't mean the games are lab-like and boring. Lumosity is very sleek, and in addition to the exercises, it makes a very detailed breakdown of how your brain is (supposedly) improving during the duration of the program. The app is free to try and has built-in subscription models. Train your brain the steampunk way! Clockwork Brain is the most unique brain gym app out of this bunch, styled in an old-school cyberpunk theme that will instantly appeal to anyone that's played Bioshock or seen Wild, Wild West. Your teacher is a robot called Sprocket that tasks you with solving mini-games, made to test your visual, spatial, logic, language, arithmetic, and memory abilities. Not only is the game beautifully hand-drawn and original, but each of the mini-games can keep you concentrated for a long while. Braingle is the simplest app in the bunch, but coincidentally, it's the most feature-packed, too. It taps into the world's largest collection of brain teasers, riddles, logic problems, mind puzzles, and optical illusions. 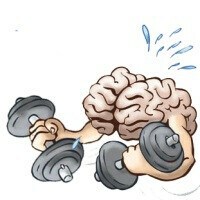 There are over 15 000 exercises available to test your brain's might, and more are being added by clever users. For fans of this type of self-entertainment, installing Braingle is practically a no-brainer. Rosetta Stone's Fit Brains is a brilliant mind exercise app which features a large number of games and activities. They are available separately and as parts of a training regimen. Completing the activities brings not only brings a feel for reward, but also calculates a Fit Brains Index which measures the performance of 5 major brain areas. If the exercises become too hard, the app will automatically make them easier so you won't become demotivated. All in all, this is one of the best apps in our list. Joggle features five fun mini-games that challenge you to tell the difference between pictures, think quickly, concentrate, and have fun with the fluid and dynamic visuals. There are achievements to be had, medals to be collected, and hopefully a lot of mental improvement along the way. "Tune up your left and right brain" with nine activities that will help you with working memory, error detection, conflict monitoring, motivation, attention, awareness and general cognitive functions. Brain Trainer’ is based on famous “Stroop effect” named after J. Ridley Stroop who discovered the strange phenomenon in the 1930s. He found that when the name of a color (e.g., "blue," "green," or "red") is printed in a color not denoted by the name (e.g., the word "red" printed in blue ink instead of red ink), naming the color of the word takes longer and is more prone to errors than when the color of the ink matches the name of the color. Brain Trainer is an excellent app and is free! Neither did two other people, apparently. Thumbs up, for the terrible pun, Mxy! oh you were trying to be funny... my bad... I usually get jokes in english... but that one did not deserve it. All right. Probably a healthier option than a Ritalin subscription. Prescription. I know the difference.